One of Nancy Oakes’ childhood memories is accompanying her mother on her annual neighbourhood door-to-door canvass for the Canadian Cancer Society. 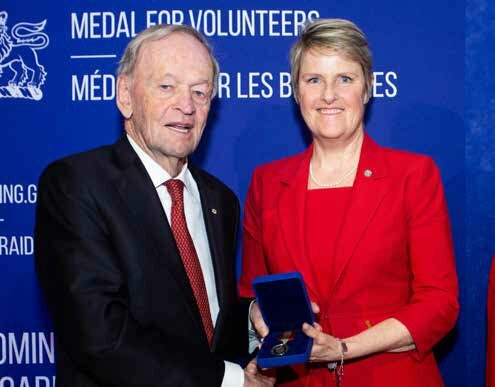 Fast forward to April 2018, when a call came from the Governor General’s office notifying Oakes that she had been nominated to receive the Sovereign’s Medal for Volunteers. As a tribute to Oakes’ parents, their best friends founded the “It’s A New Day” golf tournament. Oakes “worked a hole” at the event and it became a family affair, with her husband and brother also volunteering. Oakes, her husband, Ernie Sherman and son, Troy built a house in the Brantwood Park neighbourhood about 10 years ago. But she knew the neighbourhood well before moving in since at various times three of her siblings have lived or continue to live in this area. Apart from volunteering, Oakes skis plays golf and tennis and belongs to a book club. And then there’s boot camp! “I absolutely love boot camp. It’s a great group of people, different generations, different experiences and the amount of support and guidance and positivity in this group is extraordinary.